It is to inform you that online Registration for FY 2017-18 under “Prime Minister Fee Reimbursement Scheme (PMFRS) for less developed areas (selected regions)” has been announced. 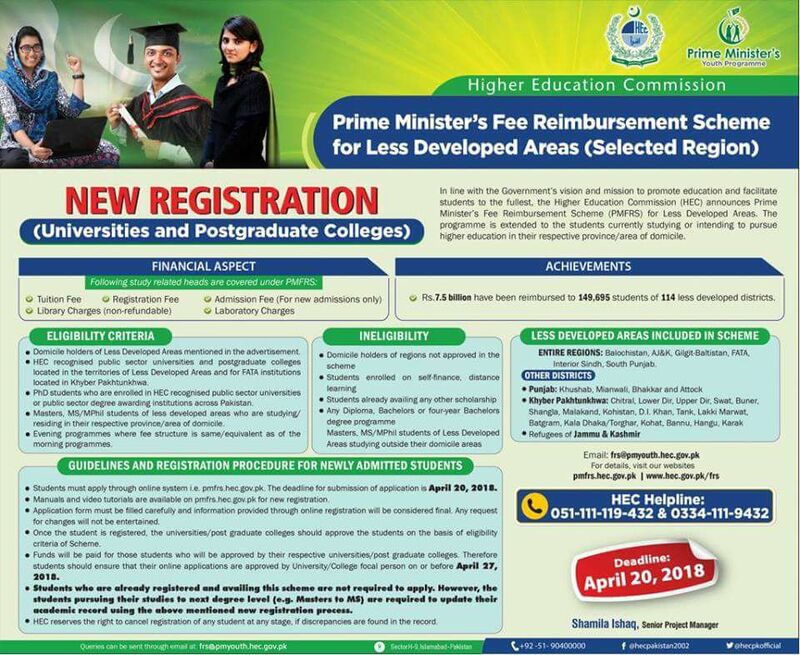 The schedule of validation and new registration for PMFRS is mentioned in the attached advertisement. All the enrolled students of Ph.D Programs holding domicile of specified regions are eligible (see the attached advertisement). Students may apply online on the web site: http://pmfrs.hec.gov.pk, and for guidelines visit: http://pmfrs.hec.gov.pk/guide.php , however, if there is any query, student can contact Student Affairs Section, CIIT, Islamabad Campus. For online registration due date is 20th April, 2018.